October is another blurry month. I did jot down a few notes about it in the new Cozi app I started using to track all of my…I mean Gretchen’s homework. There’s a little journal feature that is nice. I have started using the Cozi app almost exclusively for everything now. I have all my calendar items and I make all my lists in it because I CAN’T lose them, it’s my phone. I used to have a little notebook I would carry around and make my notes in and lists and stuff but now everything goes in my phone which would make me nervous except now everything is backed up on the cloud somewhere so losing my phone doesn’t lose my info. It looks like picture-wise, I missed almost the whole first half of October, must have been pretty exciting. The weather got nice at some point, nice as in not hot. But I can see from the pictures the kids are still wearing short sleeves and shorts for most of the month. Here they are in the backyard at the beginning of the month eating popsicles, so it must have been less than 70 because Wes is wearing a sweatshirt. The 100 degree summer really turned the kids into wusses, pretty disappointing. Gretchen finally lost her first top tooth. That thing was wiggling since May. At first she was like just pull it out Mom but it was not nearly loose enough (this was in June when it was barely wiggling). Then when it became loose enough she wouldn’t let me pull it out. What ended up happening was it just fell out in her sleep, on my birthday. She came into our room at 4:45 am as I was getting ready to go swimming with this look on her face and I was like, what’s wrong and she just opened up her mouth. She barely bled at all the tooth had been so loose. Steve had to go up and help her find it in her bed. I told her she looked like a pirate so she put on the patch. Her second front tooth was now also really loose and it hung weird but she wouldn’t let me pull it out. It was driving me crazy she just looked like she had billy bob teeth. In fact later in the month we went to a trick or treating thing at the Rocket’s stadium and we had the kids get caricatures and the artist totally gave her giant hilljack teeth. I should have told him just to draw her with both front teeth missing. In the middle of the month was my Birthday. For some reason I still get really excited about my Birthday. What I love is we’ve established a tradition of Steve/kids (though for some reason the kids weren’t into it this year?) make me a cake. The most delicious cake ever, spice cake with Peanut butter frosting. And even though I could make it anytime during the year, I just really look forward to it. And also we’ve started the tradition that Steve cooks dinner that night. Unfortunately this year I still made my dinner because I was worried he would take too long, but generally I get to sit around on my Birthday. I also love how excited the kids get about cake. Steve asked for a suggestion of a store he could take the kids to to have them pick out a present for me and I said why don’t you just take them to Hobby Lobby and have them get craft kits I can do with each of them. So for my birthday I got puppy figures to color with markers from Gretchen and Monster trucks to paint and put stickers on from Wes. The next day was beautiful so after work we sat out on the front lawn and did our crafts. Gretchen shared well and Wes let me sticker one of the trucks before he plastered it with paint covering my tasteful decorations. I’ve seen the trucks since….whizzing across the floor or being ramped off objects or in my garden in the front covered in dirt…It cracks me up. He’s still at the age where he can’t really keep a secret and when Steve came home after taking the kids shopping Wes bounded through the door and started talking about their excursion and Gretchen jumped all over him yelling at him to be quiet. He just started bawling the poor guy. Then later that night I was getting his pjs on and he just blurted out “tomorrow we get to paint Monster trucks.” Hehe…woo hoo I’m getting monster trucks for my birthday. Gretchen had her first two school parades. The first was a bear parade where everybody brought in a bear and they walked through the hallway carrying their bear. s more doll oriented. What was funny about this whole event is we had to dig through the stuffed animal toy box to even find a bear. When we decided on the bear she had to take it into school the day before the parade and leave it there overnight. Well bed time came, and seriously after not even remembering she had the bear before we rescued him from the toy box, had a total meltdown about leaving him for ONE night at school. He was going to be scared and lonely there and she REALLY wanted to snuggle with him. I had a hard time not laughing because it was just so ludicrous. And the parade really consists of the Kindergarteners walking through the halls while all the other grades sit against the wall and clap. The parents are invited to watch and go into the cafeteria after to take pictures. It’s really strange. The second parade was the Monster parade. The kids made paperbag masks and walked through the hall and then after they danced the monster mash in the cafeteria. Or in Gretchen and her friend’s case stood around while the Monster Mash played. And then pictures. It was a 40 minute affair. Steve was out of town so he missed all the fun. We went to the “largest pumpkin patch in Fort Bend County” to find a pumpkin. It consisted of a bunch of pre-picked pumpkins sitting on palates. It was pretty exciting. (there really is a need for a sarcasim font). The kids had more fun playing around in their playground. Afterwards because I never have any dinner plans on the weekends we drove through McDonalds and the happy meal “toy” was actually really cute Shrek masks. They looked pretty real. All in the same day as the pumpkin patch, it was one of our busiest Saturdays (10/19), we had soccer in the morning, then we went and picked up a bunk bed we found on Craigslist for Wes, naps, pumpkin patch, mcdonalds and then we set up the bed in Wes’s room for his first night in a big boy bed. Finally out of his crib. It took forever simply because I couldn’t find a bed I liked and I couldn’t bring myself to pay $3000 for a new one. There were a ton of cheap bunk beds on craigslist, cheap and metal or with the ladder that goes straight up and down which I did not want. And everytime there was good one it was gone within hours. Obviously, it was a good bed. This was a day we desperately needed and I dreaded so much. Moving Gretchen to a big girl bed was such an awful experience. It literally took a year to two years for her to be mature enough to mostly stay in bed. I wasn’t ready for the experience yet I wanted to get it over with as soon as possible before the baby comes and I have two kids waking me up at night. We had started prepping Wes for it a LONG time ago. We had gone to look at bunk beds at a furniture store a few months before but it never amounted to anything. He would have days where he would be all gung ho and state he was bigger now and needed a bunk bed so when he woke up from his nap we needed to go to the bunk bed store (or sometimes he would say grocery store) and get a bunk bed. Other times he would say he loved his crib and he didn’t want a big boy bed until his feet touched the end. And I think he woke up a day or two before we finally got him the bed and he told Dada it was time to get a big boy bed because his feet were touching the end of his crib. It was pretty cute when we getting the bed set up in his room, Gretchen was passing on her big sister advice. At first she volunteered to be available if he needed anything in the middle of the night. She was like “what should he do Mama if he needs me at night?” I was like; I don’t want him waking you up. If he needs anything he can just call into his monitor and a parent will help him. And then she chimed in “or you can go downstairs and wake up Mama and Dada (picture me with my hand on my forehead with a “don’t tell him that” look on my face!) but wake up Dada, don’t wake up Mama, Mama LOVES sleep.” Oh, nice recovery. It made me laugh. It’s funny how she was all willing for Wes to come in her room when he needs help because now our biggest problem is him waking her up, either settling down to go to sleep or especially in the morning. And she constantly complains that he wakes her up. In my experience with Gretchen, the night or two up to a week is always bliss. Quite honestly I couldn’t believe that Wes would actually stay in his crib at night. He totally could have climbed out if he wanted. Sometimes he would climb in to get his doggie blankie during the day and then call to get help out. He did well the first few nights, he may have come out once. We tried to tell him if he had to go potty he could just go and then get back in bed himself. This was a freedom he had to try and I think he got out of bed a night or two right after he put him down and went potty, and got back in bed. I was definitely more relaxed about Wes than I was with Gretchen. Gretchen wouldn’t play around in her room, she always would just come out and find us. Which was more of a problem because that was interrupting whatever I had going on, trying to get done to get her back in bed. And she would do it several times a night, usually an hour or so after we put her down. Wes is the playful type, I anticipated him simply getting out of bed and playing around and not really bothering us. I knew eventually he would have to get tired and would get back in bed. I was thinking I would wait, not get too involved and let the novelty of it wear off. I would hear him moving around but didn’t respond unless he started wandering out of his bedroom. I started removing the enticing toys from his bedroom and I would put the ladder to the top bunk in the closet every night so he couldn’t get up there. It was on the 22nd, 4 nights later that things finally fell apart. I could hear him moving around, obviously playing and not sleeping until about 9:30 (he gets put down around 7:45/8ish) he came down with just a pull-up on asking where his shorts were. I took him back upstairs. He had all of his cars in the bed with him, drawers to the dresser were open, clothes were everywhere, the door to the bathroom was open and the lights were on. I hunted around, found his shirt and put it back on him but I was unable to find his shorts so I just put him back in bed and left. Minutes later I hear him climbing around again. I go up, he’s in the bathroom dragging around stools trying to get into the medicine cabinet (which doesn’t have anything more dangerous than a cup and chapstick in it). I tell him it’s time to go to sleep, get back in bed and he just looks at me with this innocent face and hands out, palms up in a concerned stance and was like “but I don’t know where my shorts are.” I couldn’t help but chuckle really hard to myself and said, you arne’t going to find them in the medicine cabinet. And his shorts happened to be hanging over the side of his bed so we got them back on and into bed. He finally fell asleep at 10:30. We did things similar for awhile. We would flop back and forth. One night he would be up but the next night he was always so tired and would fall asleep. I took all his cars out of his room and told him it was because he couldn’t stay in bed like a big boy. I started the whole “Super Nanny” advice of the first time he’s out of bed you say something to the effect of it’s sleepy time you should be in bed and any time after that don’t say anything just put him back in bed. Which was a good tactic because he would just want to talk as soon as you are walking him back up and if I sent him back up he would never make it back in bed. Steve was gone for two weeks in a row at the end of October and beginning of November and I was really worried I wasn’t going to get much sleep since he would be up and down. Really once he was in bed and asleep he wouldn’t get back out and he may have come down once in the middle of the night if at all. I am so out of it at night. But then came the early mornings. What happened while Steve was gone was he started waking up earlier and earlier until one morning. And usually he would wake up Gretchen and the two of them would come down and Gretchen would come to me and be like, Wesley needs to go potty. Or Wesley needs this. It was cute, but not since it was 5ish in the morning usually. Then one day, I don’t remember what time, I kept hearing some moving around in the monitor, thought I heard some little feet in our bedroom but I was fairly out of it until I started hearing strange whispering that was not coming through the monitor. I sat up in bed and looked around expecting to have another Gretchen and Wesley appearance and Wes was sitting down in the doorway of the bedroom cross-legged, just talking away and petting Indigo who was lying on the other side of the doorjamb. It was actually pretty funny, but it was pre-5am. In the mornings where he wakes up so early, he never goes back to bed. It’s very unfortunate; he usually falls asleep after Gretchen and is usually up before her. But it is funny you can usually hear him through the monitor cheering when his clock turns green even though he is always out of bed before then. Other than random episodes he’s done pretty well. He has his moments but he hasn’t been as bad as Gretchen. It could be because he was older when we transitioned him. Gretchen was two and a half he was over three. It could be because we play up the whole big kids stay in bed like Gretchen and he’s got an example. Gretchen could have felt lonely and scared being the only one in bed upstairs and since he has company it’s easier for him, though he does not get scared like she does of things. Or it could be he’s getting out of bed as much but I’m not all uptight about it so it doesn’t feel like it’s as much. Plus he doesn’t wake me up in the middle of the night, that’s a big plus. Gretchen had a school carnival night fundraiser thing the last Friday in October. I hated it. It was crowded, it was hard to move around, lines everywhere and there was too much going on. I could hear the kids when they talked to me so I had to keep bending over to hear them and my maternity pants with their stupid elastic waist band wouldn’t stay up, so I had to hike my pants up every time I bent over and I had a greasy grilled cheese sandwich for dinner and it cramped me up so bending over was painful. It was pretty awful. The only thing more I have to say about that is the kids got to try cotton candy and ended up not really liking it. I have written in my phone journal a cute little story about Gretchen who is picking up reading fairly well though she still refuses to sound words out when she is stuck which drives me majorly crazy because if she did she could read anything at this point. I want her to be able to read anything because she is going to LOVE to read. Anyway, Gretchen was reading Hi Fly Guy (A book we got through a book order) and Chapter three the boy takes his pet fly to the pet show and the judges laugh at him and tell him a fly is not a pet and the little boy gets sad. She got to this part and when I helped her with the word “sad” by pointing to the picture she starts sobbing uncontrollably and tries to read through her tears. She wanted to just stop reading she thought it was so sad, I think she could actually feel how sad that little boy was, but I made her keep reading so she could see that it ended well, but her reading through her crying was comical. She is so sensitive, even though her crying drives me crazy sometimes; I do love her sensitivity because it makes her really considerate. We watched the Lorax for the first time over the summer (I don’t remember when exactly) and we got to the part where the guy cuts down the last tree and Gretchen just starts sobbing and asking why did he do that? Of course she wanted to stop watching at that point to. But it had a happy ending. We had the opportunity to do trick or treat the suites at the Rocket’s Stadium. It was through work because we are Corporate season ticket holders or something like that. We debated harder than we should have on whether to go. We just don’t like to venture too much. I guess we get stuck in our rut. And also I was hand making costumes this year and this trick or treat thing was a week earlier than Halloween which meant I had less time than I thought to get the costumes done. We finally decided to go, it was our first time driving into the city since we moved and it was so easy. The weekend traffic when there isn’t anything going on is awesome. The kids had a blast. The people giving out the candy in the suites were dressed to the max. It was fun; they got WAY too much candy. We got there early enough to get Caricatures done of the kids, the line was fairly short so we jumped in and by the time we were leaving it was pretty long. I made the kids costumes this year. Gretchen finally decided on a fairy and Wes wanted to be a “monster with sharp teeth.” The tough part is I had no idea what the weather was going to be like. People told me it could be anywhere from 90 degrees to 40 degrees so it took some thought trying to make a costume that wasn’t too warm or not warm enough. Gretchen’s costume was an easy no sew just loop some tulle around elastic and add embellishments. I bought wings and a hair piece to go with it. The unfortunate part about the wings is they were broken right out of the packaging, precisely why I hate buying premade costumes, they are all so cheap! I was able to rig it up with a safety pin, luckily. Wes’s costume took thought because it had to be made out of fur and trying to decide whether to make a hat for the monster face or a hood. I decided on a hood because it wouldn’t get lost if he needed to take it off because he was hot. Then I had the brilliant idea of making a vest instead of a shirt so he could wear short sleeves underneath or layers if it was cold. Brilliant idea because it worked well indoors at the trick or treat the suites and outdoors on the warm Halloween day. He did not keep the hood on very well, I think that could have been designed better but partly it could have been because it was hot. The face was simply glued on fabric teeth, glued on ping pong balls for eyes and sewn in horns that I couldn’t’ get to stand up right. At the last minute I decided to make feet which I think made the costume. I ended up using some old cushion I had left over from another project, I cut shoe sized holes, glued some elastic around so they would stay on his feet and then glued on all the fur fabric and some non-slip fabric under the cushion. They are definitely not made for wet conditions and I did get really worried when it poured the days leading up to Halloween, luckily it was done that morning (I know there were places in the US that actually postponed trick or treating because it was raining so hard there) but I figured they would be one time use. Wes was a champ walking around in them too. I like to think it was because I designed them so well to stay on his shoes. At the trick or treat the suites people kept asking me if he was from Where the wild things are, and I kept saying no, he’s just a monster with sharp teeth, but afterwards I should have just said yes. Because he did look like it and it would have been an easier answer. I think Gretchen got a bit jealous of why everyone kept remarking how cute he was. But he was really cute. I kept telling her because she was beautiful and not cute. I was pretty proud of myself, both costumes were made from scratch with no patterns, just ideas in my head. It seems everything takes longer when you involve patterns. And both the kids were excited to wear them which is the important part of it all. Two pieces of advice I learned while making the kids costumes this year. One, sparkle tool looks really great wrapped up on a roll but it is gross to work with. I picked silver sparkle tulle to add some bling but it was a different texture all together to work with it was very sticky I think because they add some stick-em to it to get the glitter to adhere. And then because the glitter is simply tacked on it gets EVERYWHERE. I kept thinking it would stop eventually but it didn’t. She wore the costume at least three times and each time it got all bunched and I had to unbunch and spray it with fabric softener to straightened it all back out again. Each time it still left a massive pile of glitter on the ground and she constantly made a trail when she wore it. We probably still have glitter in the house. Two, fur fabric and fabric glue are a bad combination. Wes’s monster feet turned out awesome but by the time I was done making them I felt like Clark Griswald after he gets done dealing with the tree. My hands were practically fur wrapped themselves and I was sticking to everything. 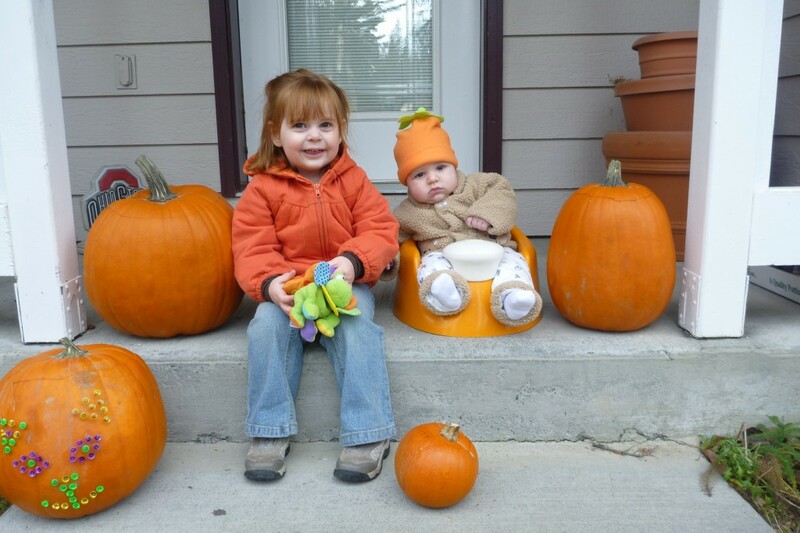 It was the kids first real trick or treat experience. Steve took them out because it was my first real handing out candy from my house experience. We didn’t get too many kids. There are so many neighborhoods around that it’s really just the neighborhood kids. Gretchen and Wes came home with gobs of more candy and after talking to Steve they maybe covered 1/10th of the neighborhood. They did a small loop and only stuck to one side of the street! That is crazy. I like Halloween; I think it might be my favorite holiday. I decorated the house, I had much bigger plans by couldn’t follow through; maybe next year. But it still looked cute. Another cute short story from my journal app….at some point in this month Wes learned how to spell his name. It was really cute, he would go around the house saying “how to you spell me? W-E-S-L-E-Y” hehe. And we had several fun nights at dinner. No one can get Wes rolling like Gretchen. I have no idea what it is, she can do the stupidest things and he will just full on belly laugh, it’s really cute. We can’t get him to laugh like that. One night Gretchen got him into eciting the Brown Bear Brown Bear book but he doesn’t really know the words by heart like she does and so he started making things up like Angry Monster Angry Monster what do YOU see, I see a Golden Sun…Golden Sun Golden Sun…then he said BIG Eye Big Eye but as he said it he started acting out Big Eye and Gretchen got into it and Dada made a big eye too and I had just taken a drink of water and it was hilarious from my perspective and I started choking because it was hilarious. Steve thought it was funny that Wes could choke me up like that. 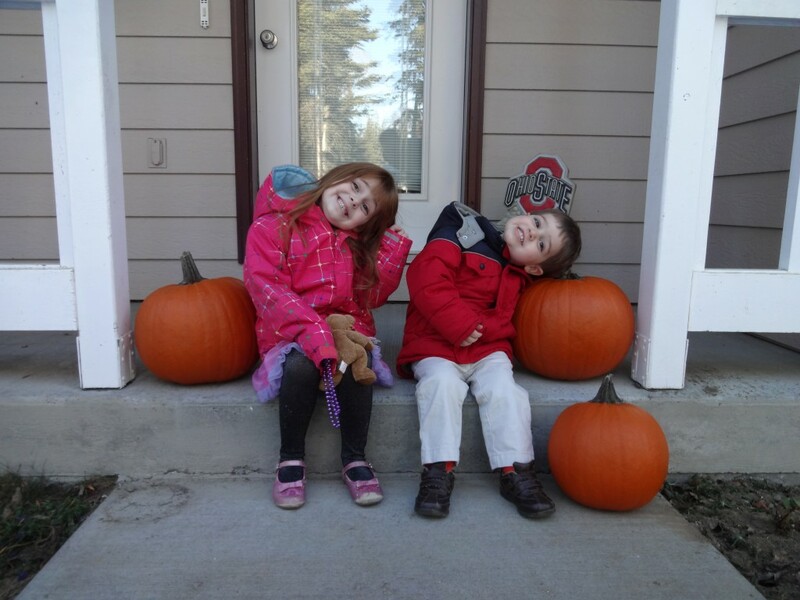 I was still able to maintain the tradition of taking pictures of the kids on the front stoop with pumpkins. You’ll hear this every year because I don’t expect you to remember (except for the person I got the idea from). Our neighbor from Findlay took a picture of her kids on the front porch of their house every year on the first day of school until they graduated and then made a collage of all of them and it was so cool. She showed me this before I had kids. So I decided to start it. I happened to have started it on Halloween so I’m not doing the first day of school but in October sometime. I hope it ends up okay in the end (as long as I maintain it) because the kids do get silly taking the pictures.